If you live in the state of Wisconsin the football team you support is the Green Bay Packers. Green Bay is a small city in northeastern Wisconsin but its fans are among the most loyal in the NFL (National Football League). The season ticket waiting list has more than 81,000 names and the average wait for tickets is 30 years. That's devotion! 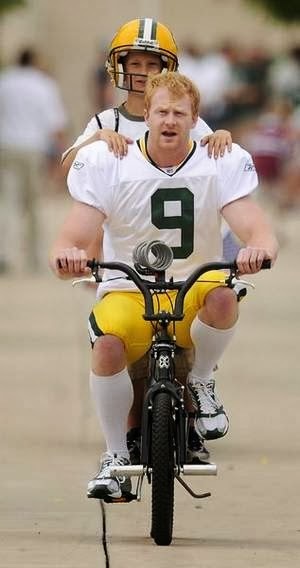 One of the most heartwarming traditions occurs this time every year, during Green Bay Packers training camp, when players "borrow" kids' bikes and ride them from the locker room to the practice field. Sometimes called the Bike Brigade (a brigade is a group of people with a common characteristic or cause) this decades-old tradition was started by legendary coach Vince Lombardi and it has since continued every year. The ride to the practice field lasts only two minutes but the opportunity for young fans to connect with their favorite players is a thrill! I am glad to see that a time honored tradition continues.